As wonderful a breed as the Chesapeake is, it is not a breed for everyone. They need daily companionship and exercise along with obedience work and socialization to help them become good citizens. These tasks cannot be put off. With its protective and dominant nature a chessie can become more of a handful than many families are prepared to accept. PLEASE, do some homework and research before deciding to adopt a Chesapeake Bay Retriever. DO CHESAPEAKES MAKE GOOD FAMILY PETS? Yes, they thrive on being a part of the family, BUT must be socialized and obedience trained early on. Early months are critical – your chessie needs to experience many GOOD experiences. The Chessie takes his job of caring for his family very seriously; he must have an owner that he knows is in control. Thus the chessie; he must have an owner that he knows is in control so he will not feel the need to take over. WILL A CHESSIE TRANSFER ITS AFFECTIONS & LOYALTY? Yes, the breed is very intelligent and knows when good things are happening. However, some take longer than others to settle into a new home. But in time, as he feels safe and secure, the new family will be rewarded with much love, respect and trust. SHOULD A CHESAPEAKE ALWAYS BE A HUNTING DOG? Not necessarily. As much as a Chesapeake loves his field and water work, he also loves his person/family and will enjoy sharing activities with them…. hiking, games of fetch, obedience and agility work can all be ‘jobs’ to help the chessie feel useful. Remember, the Chesapeake was bred to take care of his person’s belongings, as well as retrieve all he shot for market. This protective nature and need to work are inherent…. it would not be a true Chesapeake if these qualities were bred out. In the nearly 200 years since the Chesapeakes originated, the country has changed; the dedicated market hunters on the Shores of the Chesapeake Bay are no longer . Yet, the Chesapeake Bay Retriever still carries the drive and devotion that made him the loyal working companion of that hunter of long ago. ARE CHESAPEAKES GOOD WITH CHILDREN? Yes, with proper socialization and obedience work, a Chesapeake can make a wonderful companion for children. However, a dog should never be left unsupervised with children, especially ones who are excitable or overprotective. ARE CHESSIES LIKE LABS AND GOLDENS? No, although they have common ancesters, Chesapeakes have a different mind-set . The whole approach to training needs to be different – individually geared to the nature of the Chessie. The fact that they are thinking dogs, coupled with their stubbornness and perseverance, sets them apart from the other retrievers. HOW DO CHESSIES GET ALONG WITH OTHER DOGS, CATS, ETC. This is an individual thing – a true chessie will ‘live and let live’….. not be too concerned for the other dog, unless there is a serious territorial issue involved. However, some Chessies, with a very strong prey drive, are not to be placed in homes with cats or other smaller animals. If brought up in these situations from puppyhood, generally it works fine. A second-hand dog (rescue) might have issues, thus the rehoming process needs to be very carefully evaluated. ARE THERE SPECIAL GROOMING NEEDS FOR A CHESAPEAKE? Not really; we like to call them ‘wash and wear’ dogs. Low maintenance. In the marsh this morning – in the show ring this afternoon. Basically, ear cleaning, nail trimming, brushing out of dead hair (NOT a wire brush) and some teeth brushing will keep your Chessie ready for any event. Bathing with a natural soap is an option…. chessies need the natural oils in their coat to repel the cold water; however, some tend to have an odor peculiar to the breed – but not really a problem. These are dogs that do not need to go to the Groomer – the owner should be able to do these basic tasks… the better to stay acquainted with your companion. DO CHESAPEAKES HAVE PARTICULAR HEALTH PROBLEMS? Yes, as in all breeds, there are tendencies for inherited health problems. Hip Dysplasia, PRA and cataracts are the most prominent in the Chesapeakes. When purchasing a new pup, you should see proof of hips and eye exams of each parent before breeding. There are incidents of skin allergies, thyroid problems – but these are very individual. When adopting a rescued dog, it has to be a leap of faith! Always use high quality food! Top brands now carry large breed foods, often with dental care and joint therapy additives. Usually a diet of dry food will suffice. But these brands carry companion canned foods -which should be used sparingly. Kongs and nylabone chew toys help with the need to chew. Many of our dogs coming into rescue have not had good diets, but after 4 to 6 weeks of top shelf feeding, coats show remarked improvement. 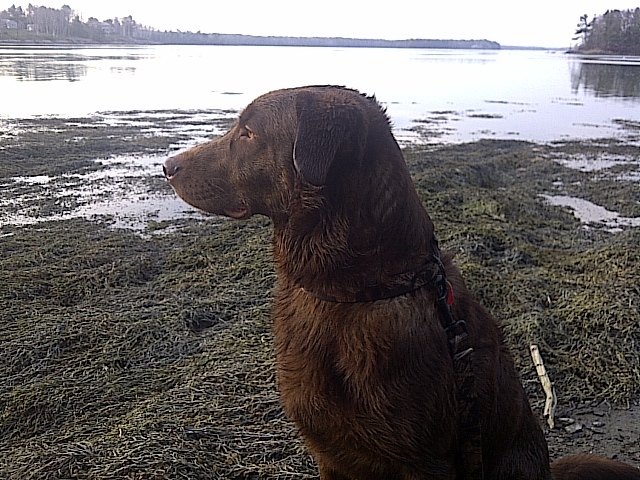 Chesapeake Bay Retrievers are NOT guard dogs and should not be encouraged to be such. Their very nature is to be protective, and this needs to be kept in careful check, not encouraged further. We cannot stress this enough, thus the early socialization, obedience training are critical as a part of the life of all Chessies, pups or rescued dogs. THIS BREED MUST NOT BE CHAINED OUT OR BANISHED FROM THE LIFE OF THE FAMILY! Remember, the Chesapeake needs to take care of its family. It earned a bad reputation in the years that hunting dogs were relegated to a chain in the back yard…. this led to frustration and an anti-social dog. WE WILL NOT ADOPT A CHESSIE INTO A HOME THAT DOES NOT PLAN TO MAKE IT A PART OF THE FAMILY! Many chessies have a wicked smile – toothy, maybe a lip curl. It is a special trait, and a special treat to be the recipient of such a smile.